When Save the Children found David Nyorkor in November 2014, he had been locked in his bedroom for six weeks. It was at the height of the Ebola epidemic and Yenga, a small village along Sierra Leone’s eastern border with Guinea near the epicentre of the outbreak, was devastated. David had contracted an unknown illness long before Ebola swept through the village and killed nine members of his family. But accurate information about the disease was scarce and superstition was rampant, so community leaders locked him in a bedroom in his empty family home, where he remained until Save the Children arrived. “I tried to get out but I was never able, so I stayed in the room, in bed always,” remembers David, who is now 15 years old. 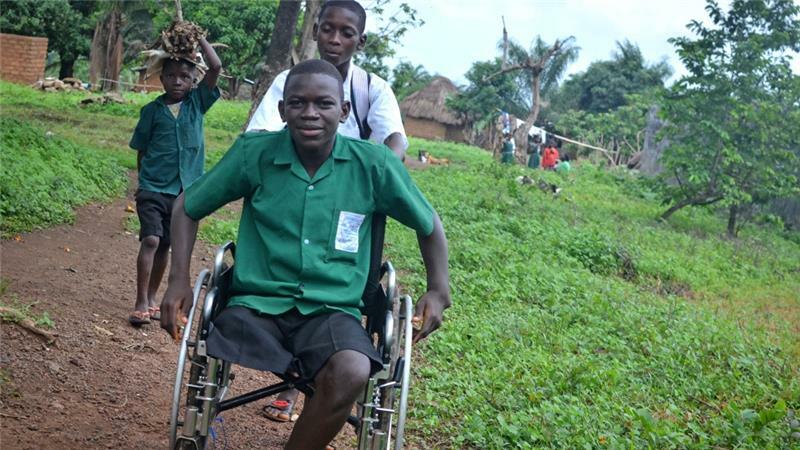 But, more than 18 months after he was rescued, David is back in the same community – only now, he is disabled. A victim of a health system decimated by the Ebola epidemic and an overwhelmed international relief agency, David’s leg had been amputated – unnecessarily. Convinced that the six weeks he had spent in isolation in his room in Yenga had ruled out any possibility that he may have had Ebola, Save the Children took David to Connaught Hospital in Freetown instead of to an Ebola treatment centre for observation. The hospital had been overwhelmed for months by the city’s high rate of Ebola infections and, two weeks after he arrived, junior staff at the hospital went on strike following the deaths of three doctors to the disease in just two days. By the end of the month, the diminished Connaught Hospital staff announced that they were unable to diagnose David’s condition. Large sores had developed on his left arm and right leg, and with the only pathologist in the country preoccupied with Ebola cases, hospital staff recommended that his leg be amputated before further observation. Save the Children, fearing David’s life was in danger due to the spreading sores and delays in administrative processes, agreed. “At the beginning the process was out of our control because it required a lot of back and forth, getting consent from the family, getting doctors to do samples,” said one Save the Children employee who wished to remain anonymous. Fatima Sia, one of David’s aunts who had brought him meals while he was confined to his room, travelled with him to Freetown and provided consent for the operation. Sia says that at the time she was under the impression that David’s illness had been identified and that amputation was the only treatment. It wasn’t until after David recovered from the operation that she realised he didn’t yet have a diagnosis. Save the Children contracted an American social worker, Teresa Brooks, to handle the case. David met Brooks, a former case worker for the Nevada juvenile corrections system, in January 2015, following his amputation and release from hospital. Save the Children arranged for David and Sia to live in a spare bedroom in a local family’s house while observation continued, and Brooks visited David several times a week to take him to his weekly check-up, deliver medication and assist him with physical therapy. By December 2015, almost a year after his amputation, it was apparent that the tuberculosis diagnosis was incorrect, and David’s doctors recommended that his arm and other leg be amputated as well. This time, however, those at Save the Children responsible for his case, weary of the previous misdiagnosis, did not consent to the amputations and arranged for samples from the sores on his body to be sent to a pathologist outside the country in order to identify his illness before taking any further action. The results showed that David was suffering from a severe bacterial infection. He was treated and cured shortly after his diagnosis.